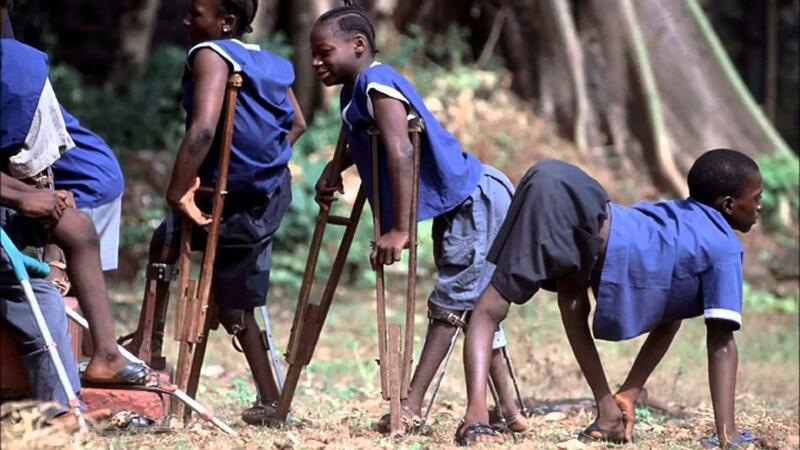 Polio mainly affects children under five and can cause rapid paralysis and sometimes death. Once a worldwide scourge, concentrated vaccination efforts have caused the total number of cases to drop from about 350,000 in 1988 to to just 37 last year, in Afghanistan, Pakistan and Nigeria. Few people under 50 in the UK will know anything about the devistating effects of this disease and therefore not understand the need to eradicate it completely. These videos take a harrowing look at Polio. Most British doctors and nurses working today will never have treated a case of polio. The closest most of us ever come to the polio virus is swallowing a sugarcube containing the oral vaccine or taking our children for their jabs. Today, we stand on the brink of eradicating polio from the world. Yet for anyone over the age of 50, polio still casts nightmarish shadows of babies entombed in iron lungs, children hobbling in leg irons and adults confined in wheelchairs. Seemingly appearing out of nowhere in unstoppable epidemics, polio killed or paralysed millions, and mostly affected children. The disease grabbed headlines, stoked panic and drove massive fundraising campaigns. Doctors and scientists were powerless to prevent or treat the scourge. Polio survivors share their accounts of what it was like to live through the polio epidemic as children. Historian Dr. Daniel Wilson, author of the book “Polio Voices” leads us through a brief history of polio and its first U.S. outbreaks. An animation shows how the polio virus infects the human body. In 1920, Franklin D. Roosevelt was the shining star of the Democratic Party and a Vice Presidential candidate when he was struck down with Polio. This segment traces FDR’s journey to Warm Springs, Georgia as he desperately tries to find relief from the effects of Polio for himself and others. John Steinhauer talks about his time at the Warm Springs Rehabilitation Center with FDR. Dianne Odell of Jackson, Tennessee has lived in an iron lung longer than anyone alive. She tells the story of the day she fell ill with polio and describes what it’s been like to live her life in an iron lung and why it is the only way for Dianne and others like her to survive. With no cure in sight, scientists and researchers began the race to prevent polio. With FDR’s help the U.S. witnessed the creation of the fundraising powerhouse now known as the March of Dimes to help find a vaccine. In this segment, we take a look back at the brilliant work of Dr. Jonas Salk and Dr. Albert Sabin both credited with discovering two very different, but effective vaccines, as well as the grave mistakes that were made in the rush to stop Polio. The last surviving member of Salk’s dream team shares his perspective. The World Health Organization has declared Polio conquered in the Western Hemisphere, but Polio has returned to the U.S and still remains a problem worldwide. This segment examines why some parents are not getting their children vaccinated. It also explores a nightmare scenario in which polio reemerges in the U.S. Hear first-hand from Polio survivors who worked hard to regain mobility following their bouts with polio as children only to find that decades later their bodies are beginning to fail. They’re facing a condition known as Post Polio Syndrome. See why Post Polio Syndrome is a growing problem and why its treatment is counterintuitive. Serious challenges, including violent attacks on health workers by Islamists, poor routine immunisation coverage and rumours the vaccine causes impotence make this a precarious possibility. But if India can do it, why not the world?